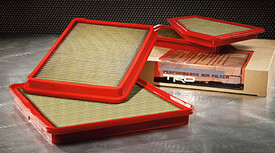 Providing engine protection and potentially increasing engine output, the TRD high-performance air filter features a unique, oiled four-ply cotton gauze design that maximizes the filter’s media area for superb filtration and enhanced airflow. A rugged polyurethane body holds the filter element, which is enclosed in durable epoxy coated mesh and an elastomeric seal for a precision, leak-free fit. It’s also washable, reusable and designed to last the lifetime of your vehicle..
Notes: Air Filter (Vehicles Equipped W/ 4.0L V6).